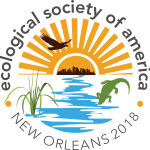 Environmental scientists, educators, and policy makers will gather at the Ernest N. Morial Convention Center in New Orleans, Louisiana this August 5th through 10th, 2018, for the 103rd Annual Meeting of the Ecological Society of America. Ecologists from around the world attend the 5-day conference, which is expected to host over 3,000 scientific presentations this year. ESA invites press and institutional public information officers to attend for free (see credential policy below). To apply, please contact ESA Communications Officer Liza Lester directly at llester@esa.org. Walk-in registration will be available during the meeting. Meeting plenaries and symposia will delve into recent events as they explore the meeting theme “Extreme events, ecosystem resilience, and human wellbeing.” In the past year, record hurricanes, flooding, heat waves, and wildfire impacted ecosystems and communities in the United States and around the world. Shortly after Category 5 Hurricane Irma clipped Puerto Rico and pummeled several Caribbean Islands, a second Category 5 storm, Maria, made direct landfall on the US territory, to devastating effect. Puerto Rican native Ariel Lugo, director of the USDA Forest Service’s International Institute of Tropical Forestry in San Juan, will deliver a plenary lecture on Monday, August 4th, on the adaptions and resilience of social-ecological systems in the Caribbean to extreme events. Robert Twilley, executive director of the Louisiana Sea Grant College Program will open the main program on the evening of Sunday, August 4th at 5:00 pm, with a plenary lecture on ecosystem design approaches in the highly-engineered landscape of the Mississippi River Delta, where water, energy, materials, and money flow together in a complex system of natural and social infrastructure. Meeting field trips will explore the meeting’s theme outside the convention center, with a particular focus on wetlands, which harbor wildlife, improve water quality, and buffer coastal communities from wind and storm surge. Louisiana holds more than 40 percent of the wetlands in the continental United States. The Pelican State is also the site of the greatest wetlands losses. With the disappearance of swamps and marshes, the state is losing its coastline to erosion at a rate of 43 square kilometers per year, or about a football field every hour, according to the US Geological Survey. Local ESA members will lead visiting colleagues to the Mississippi Gulf Coast to find carnivorous plants, and guide a canoe outing under the moss-hung bald cypress canopy in the freshwater wetlands of Bayou Manchac. A service trip led by the Lake Pontchartrain Basin Foundation will pick up litter in the urban marsh at the mouth of Bayou St. John. On a crosstown walk down Washington Avenue, visitors will explore environmental and socioeconomic change in a post-Hurricane Katrina New Orleans neighborhood. 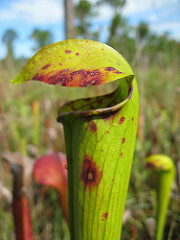 A pitcher plant in Mississippi Sandhill Crane National Wildlife Refuge. Robert R. Twilley is executive director of the Louisiana Sea Grant College Program and professor in the Department of Oceanography and Coastal Science at Louisiana State University. For the past two years, he has served as president of the Coastal and Estuarine Research Federation, an international organization of scientists and managers who focus on coastal issues. He has published extensively on mangrove ecology, and has been involved in developing engineering designs to rebuild coastal and wetland ecosystems. Puerto Rican native Ariel Lugo directs the USDA Forest Service’s International Institute of Tropical Forestry, based in San Juan. In his research into the cycles of nutrients in the functioning of ecosystems, he has studied mangroves; freshwater wetlands; dry, moist, wet, and rain forests; and tropical tree plantations. Currently, Lugo is dedicated to the study of tropical cities and novel forests. With temperatures rising about twice as fast as the global average, the Arctic is a showcase for the interplay of ecology and society in a rapidly changing world. Lauren E. Culler, a research assistant professor of Environmental Studies at Dartmouth College, studies Arctic insect communities. As outreach coordinator at Dartmouth’s Institute of Arctic Studies, she leads NSF-funded student science expeditions to Greenland and Antarctica. ESA’s press office provides complimentary registration for professional journalists attending to gather news and information to produce media coverage of the Annual Meeting. Credentials considered for press eligibility include a recognized press card or current membership in the National Association of Science Writers, the Canadian Science Writers Association, the International Science Writers Association, and the Society of Environmental Journalists. Freelancers must be currently active in journalism and able to present recent bylined news stories in the natural sciences. We do not offer press registration for editors of peer-reviewed journals, ad sales representatives, publishers, program officers, or marketing professionals. Members of the press may attend all research presentations, but some events, workshops, and field trips may not be open to reporters without prior arrangement. We offer complimentary registration for press officers and public information officers. Press officers who cannot attend, but would like to promote presenters from their institutions, are welcome to prearrange distribution of press releases and other author materials on the meeting website and in the on-site Press Room. Press officers may request copies of all abstracts related to their institution. For registration, more information, or help finding scientists in our meeting program, please contact Liza Lester at llester@esa.org or (202) 833-8773 x211. Pre-registered press may pick up their credentials in the Press Room and enjoy coffee, tea, internet access, a printer, telephones, and an interview area. Journalists may also register on site in the Press Room.